Three years ago, in the atomic wasteland that was November 2012, our beloved game took a hated turn for the worse that sent thousands of players into quitting – the beloved land of Tutorial Island became no more. Ever since that fateful day, the comments on everything RuneScape related were nothing but hateful messages, demanding the return of the island. Sometimes they misspelled “bring back the island” as “remove the EoC” but regardless, all they ever wanted was the place they began RuneScape in to return to them. 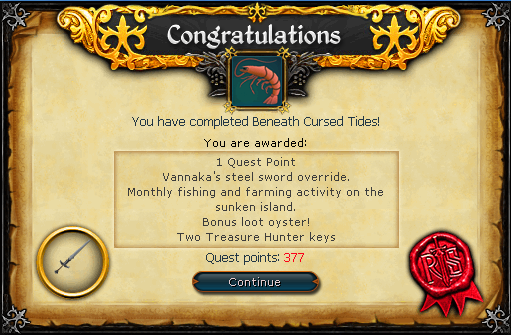 On the 14th of December, 2015, their prayers were answered – the form of the brand new quest, “Beneath Cursed Tides” suggested on RuneLabs by the player “Guitar Girl” which allows the adventurers to return to the island once again, and save it from the terrible fate of the evil hydromancer. Let us begin. A few years ago, the island mysteriously vanished and Myrtle from the Wizards’ Tower is keen to find out why. In Beneath Cursed Tides, you’ll be searching for survivors and working with Vannaka, journeying to the bottom of the sea to investigate the islands watery fate. A dark tale awaits. Expect a journey full of teary nostalgia and classic humour. 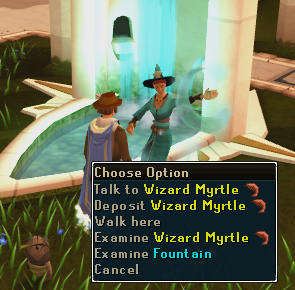 Speak to Wizard Myrtle just outside the Wizard’s Tower, south of Draynor Village. The quickest access is via the Fairy Ring, code D.I.S, or with an Amulet of Glory. 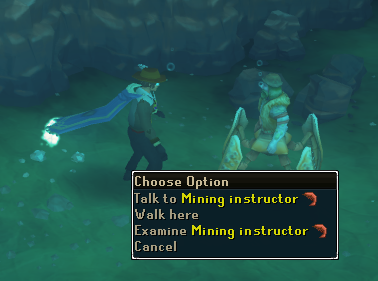 The Draynor lodestone works fine too. Just outside the Wizard’s Tower you can find Wizard Myrtle, demonstrating an impressive display of water magic. Speak with her, and she’ll reveal that she is a hydromancer who is attempting to locate her former mentor – Wizard Terrova. She is attempting to return to the island he resided, now at the the bottom of the ocean, but needs your help because she has an ironic fear of deep water. 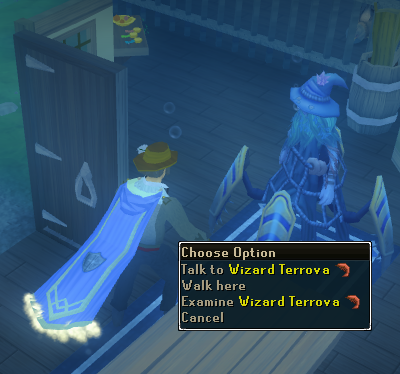 She instructs you to find Vannaka, the only person left from Tutorial Island who has not gone missing. 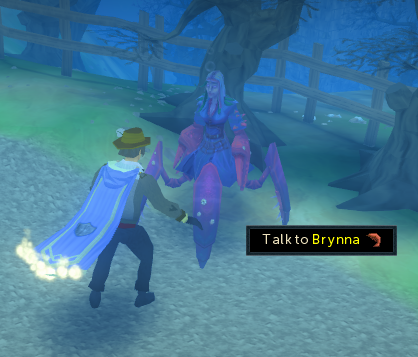 Travel to Edgeville Dungeon – the quickest method being via Amulet of Glory, but the lodestone works just fine – and tell him about Myrtle’s plans. He’ll agree to go underwater with you, telling you to meet up again with him at the tower. Return back to the Tower and speak to Myrtle, who will tell you her plan of action – enchant you with an underwater breathing spell (unless you have other means of underwater breathing, such as the aquarium outfit or the diving apparatus and fishbowl helmet from Recipe for Disaster) and send you down to the island, where you are to discover what has happened, and find the fates of the unfortunate tutors left behind. The dive point is decided to be Mudskipper Point, where you must then travel to begin your downward descent. You’ll find yourself in a familiar room. If you ever played Tutorial Island in the past, you’ll know exactly where you are – this is the room the tutorial began, where you designed your character for the first time. If you try the door at first, you’ll discover that it’s locked – it isn’t so simple this time. 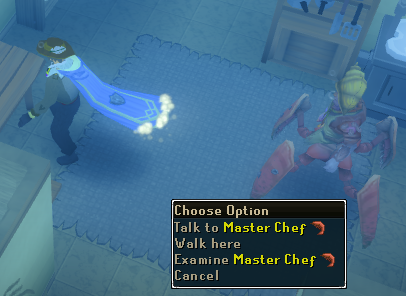 There is no RuneScape Guide with an elegant Red Beret to point you outside. 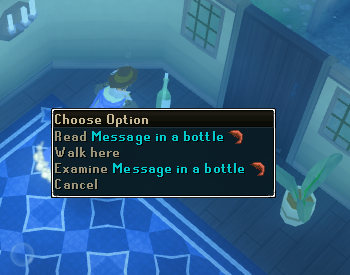 Search the message in a bottle found besides the door, and read the text to the end to find the key to the door. Now you’re outside, follow the path and you’ll notice something odd. Brynna, the original Survival Guide, has changed. She doesn’t seem to notice this. She’ll mistake you for another new adventurer (whilst both vaguely remembering you and commenting on your erratic fashion sense) and instruct you to make a fire. It takes a bit of arguing to get the point across that only Spongebob was ever able to light a fire underwater, but she’ll still want you to catch and cook shrimp to proceed. A swarm of shrimp should be seen floating around the old fishing pond. Click on them to catch a raw shrimp, and float over the hot vent to cook it. Brynna flips her shrimp when she sees that you were the first adventurer she ever taught to cook a shrimp correctly on the first try, and refuses to let you pass until you experience the sorrow of burnt food. This is a little trickier than it was when you did Witch’s Potion – using the shrimp on the vent again does not work. To burn the shrimp, cut a piece of strong seaweed by clicking on it. 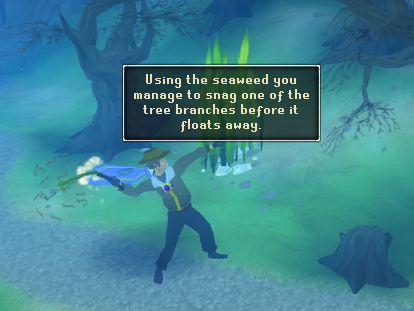 Fell a tree, and your character will lasso a branch quickly before the tree floats away. Once you obtain the branch, float over to the small boulder sitting next to the hole in the ground – use the branch to push the boulder over the hole, which greatly increases the heat of the vent and allows you to burn the shrimp. Brynna is satisfied, and allows you to proceed. You may remember cooking bread in the tutorial. Lev is a little more at sense, and already knows that bread underwater is impossible. So he instead asks you to make a sea salad. He needs some edible seaweed to begin the teaching, but all edible seaweed is guarded by an angry literate jellyfish. To counter this, Lev gives you an old music box, which you must use to ease the jellyfish into happy nostalgia and distract him from his guard duty. Float over to the jellyfish, and play the options 2, 3, and 1. You may then take some seaweed and bring it back to Lev. He then asks you to make three salads. It’s a simple process – he will ask for three ingredients, and all you have to do is cycle through the ingredients until you find the right ones, and add them to the salad in the order he instructs. Once you’ve done that, follow the path, and take the ladder down to the caves. The no-fire-underwater problem is getting somewhat irritating. Dezzick, also now a sea monster, (yet none the wiser) asks you to make a Bronze Dagger. As the furnace does not work when filled with water, you must solve this problem. After mining the tin and copper required to make the Bronze bar, add them to the furnace, and close the doors. Use the nearby pump to blast all of the water out of the furnace, leaving it dry and ready to use once more. Ignite it and open the door to receive your bronze bar. (If you want to make more Bronze bars, you must either repeat this process or add more ore to the furnace before closing the doors and draining it of water) Make the Bronze ‘butter knife’ as it turns out to be, which will impress Dezzick enough to let you through to the combat stage of the tutorial. Vannaka and you discuss the state of the island, and you inform him of the curse placed upon the island that morphed everyone into monsters. He decides that to help break the curse, him instructing you with a task would be a good idea, and uses this opportunity to teach you the nimble art of using a two-handed sword in one hand. Enter the cage of Sea Rats, and pick up his sword and shield. You will be blindfolded (most likely so we still never see the amazing use of a two-handed sword in one hand) and a flash event will occur. 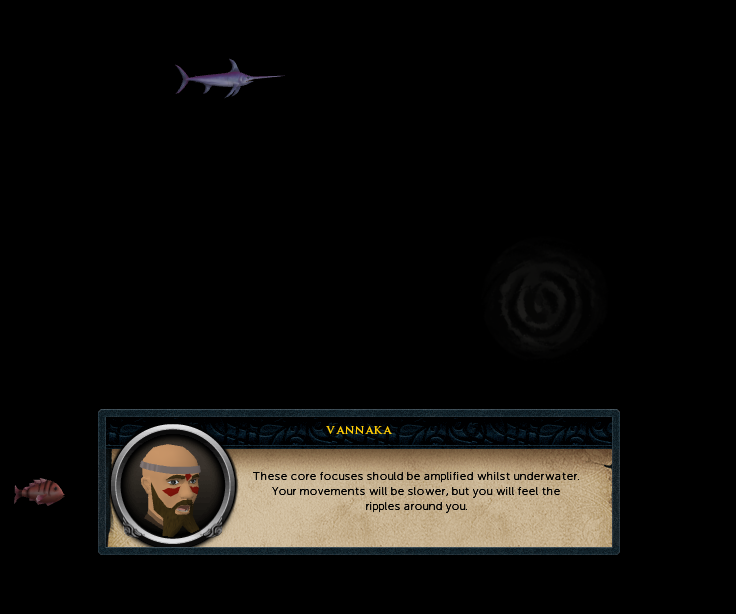 Click on all rat heads and air bubbles, and Vannaka will guide you through the process of striking with such a heavy blade. Once you remove the blindfold, you will look around and see that all of the rats are dead, hovering suspended in the water. 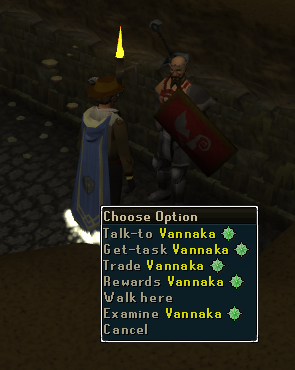 Vannaka will congratulate you on your efforts, and send you up to the bank. Despite his isolation from society for so long, the financial advisor has wisely realised that skilling and questing are no longer viable moneymakers. He also laments the lack of money you can gain from killing monsters, but that’s probably because his slayer level is too low. However, the banker’s day job has finally gotten the best of him (or maybe it did a while ago) and managed to work him to his death. Had work, standing up. At desperate measures, the financial advisor suggests you rob him to make money. There is a vault which contains numerous piles of money, stolen from innocent adventurers who never made it. To open the vault, enter the PIN ‘139’ (which you can figure out through reading the diary to discover the banker’s age, reading the calender to find out the year, and reading the memo to get the hint about using birth years as a bank PIN) and steal all ten piles of 25gp. He deems you rich enough to proceed. 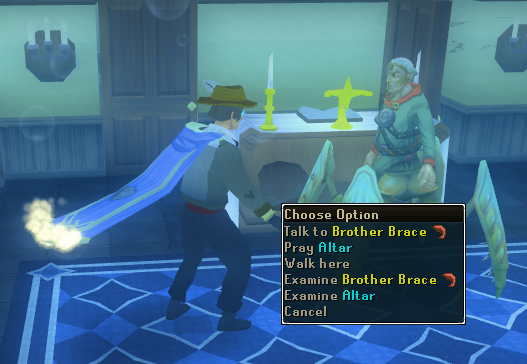 Brother Brace has misplaced his prayer book, which he needs to communicate with Saradomin. He asks for your help finding it, and instructs you to talk to his fish friends outside the chapel to find it. He gives you his friends list (which consists of three people) and tells you to use this to talk to the fish, as they are very shy and only respond when mentioned by name. The fish can be found around and outside his chapel, but also as far back as beyond the bank by the ladder. Talk to the ones on the list, and you’ll eventually find the one that last saw the book, and he will instruct you to a piece of scenery. Find the book with the fish’s directions, and take it back to Brace, who will be thrilled, and send you off to your final tutor – Terrova. Terrova has enchanted his chickens with a fate beyond death – he has put air bubbles around their heads, ensuring they continue to breathe and live forever in his cage. He asks you to cast Wind Strike on them, and insists you do so without the help of any runes. 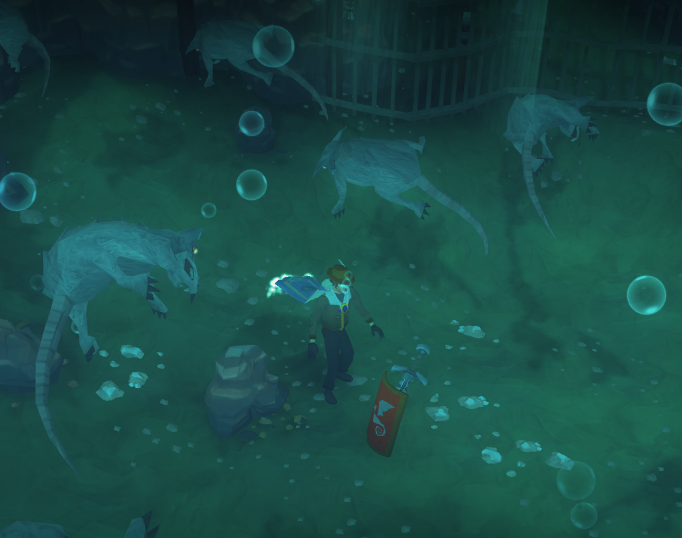 Clicking on the chickens will allow you to cast a spell at them, which encases them entirely in a bubble of air, sending them floating away. Do this to a few chickens, and then speak to Terrova again. Joyously, he will tell you that you have completed your training and are ready to become an adventurer, but is quickly interrupted by the sudden appearance of the evil hydromancer, Hector Vivian. Hector is furious at your attempts to break his curse, but is also delighted that you brought Vannaka right to him, the final ingredient he needed to fully complete his curse. As he is about to do so, Wizard Myrtle descends from above, overcoming her fear of the depths, to battle back against him. So begins the most Harry Potter-inspired battle I’ve ever seen. Hector and Myrtle cast spells at each other and are locked in combat, each trying to push the center of the spell into the other’s hands. You must assist Myrtle by both clicking on the beam to push the center towards Hector, and click on the Crassian minions he spawns that attack Myrtle. As the spell gets closer to Hector, the more and more Crassians that spawn, so be careful – you may have to forgo pushing the spell back for long periods of time to combat the sheer number of Crassians. Once the spell is forced fully back against Hector, he is defeated, and trapped inside an air bubble. You, Vannaka and Myrtle will return to Mudskipper Point above the surface. After a brief discussion, all the tutors will also resurface, and are now reverted back into their human forms, as the curse was broken and they are no longer Crassian Sea Monsters. Myrtle will give you your reward for helping her cause, and congratulations, quest complete! Three XP lamps, which together reward the player 5,000 Cooking XP, 5,000 Fishing XP, and 10,000 Combat XP in any Combat skill, including Summoning, Herblore & Slayer. Lev’s Old Music Box – a one-use item that unlocks the original Newbie Melody soundtrack from the early 2000’s. Players can return the island at any time by speaking to Myrtle at the original quest starting point. 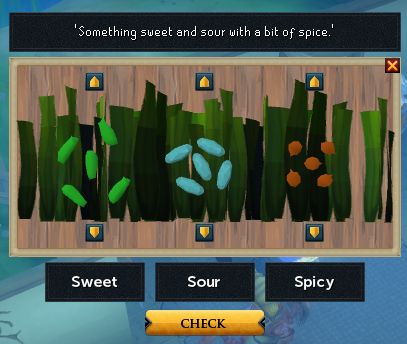 Once a month, the player may harvest the edible seaweed for a ‘delicious seaweed’ item, and fish at the fishing spot for a ‘sea cucumber’ which both reward very satisfying amounts of XP in Fishing and Farming. Both items are then placed into the Oyster’s mouth, which will then ensure that you complete the monthly and allow you to do it next month.